We offer the best collection of black and purple tomatoes full of rich flavors. Some of our most popular varieties include Black Krim, Paul Robeson, Cherokee Purple, Black Sea Man, Purple Russian and Pruden's Purple. One of our “best-tasting” black tomatoes. Outstanding 3-4", delicious tomato suited for garden or container on patio. One of the largest Russian black tomatoes. Award-winning. Delicious, slightly-salty, smoky-fruit flavors. Outstanding! One of our most popular black tomatoes. Fantastic, intense flavors. Perfect choice for slicing, salads and cooking. Shaped like miniature pears. Good cooler-climate tomato. Perfect for salads, snacking or sauce. Disease resistant. Very popular tomato. Perfect for patio garden, eating fresh or making a delicious sauce. Good canning tomato. RARE. Big, richly-flavored, early tomato. Perfect for sandwiches and salads. Grows well in mid-sized containers on patio. Exceptional heart-shaped tomato for cooler and warmer growing regions. Big, robust flavors. Disease resistant. Dwarf Tomato Project. Produces high yields of 10-16 oz., purple tomatoes with huge, rich, delicious flavors. Good yields of 1 lb., purple/black tomatoes with rich, complex flavors. Best suited for salads, sandwiches and salsa. 14 oz., purple-brown, tomatoes. One of the darkest black tomatoes with delicious, flavors. Winner “Best Tasting” award. 1 lb., meaty, black oxheart tomato with mahogany colors and good flavors. Contains sufficient acid for great taste. Chefs love this because of its exceptionally complex tomato flavors. A preferred market tomato with all growers. Very popular market variety because of its rich, complex and sweet flavors. One of the best tasting heirloom tomatoes. Dwarf Tomato Project. Dwarf plant produces 8 oz., chocolate-brown tomatoes with jagged green and gold stripes. Light-yellow, cherry tomatoes with anthocyanin coloring. One of the sweetest cherry tomatoes available. RARE seeds. Dwarf Tomato Project. 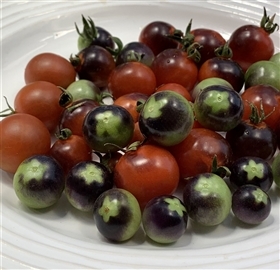 Dwarf plant produces BIG crop of 6-16 oz., heart-shaped, purple-black tomatoes. Delicious! Dwarf Tomato Project. Dwarf plants produce abundant yields of 12 oz., purple tomatoes with rich, delicious flavors. Vigorous, big producer from the 1800s. Packs a wonderful punch of delicious flavors. Good hot weather tomato variety. Heavy loads of 3/4 ", dark-blue cherry tomatoes that have a distinct acidic tang to the sweetness. Impressive! WOW! 10-12 oz., dusky-purple tomatoes with complex flavors. Suited to late season coolness. Perfect for sandwich or sauce. 3-4 oz., purple/black tomato. Good market tomato due to its fine appearance, sweet/tart flavors and long shelf life.